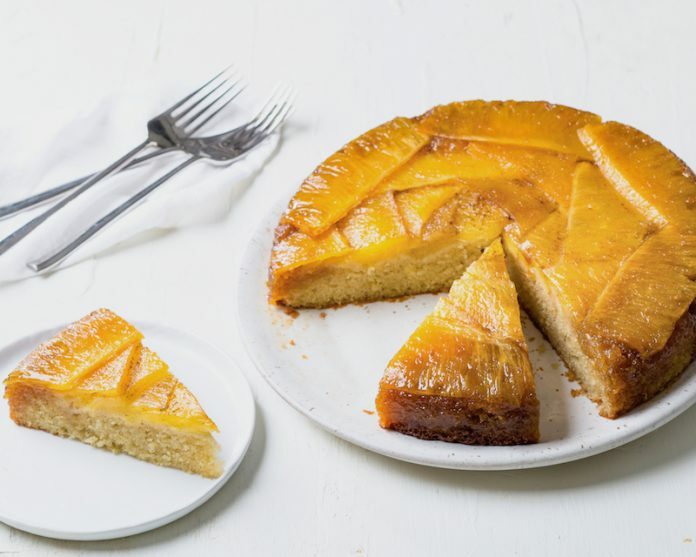 This buttery pineapple upside-down cake gets a rich sweetness from Heilala Vanilla Extract while Heilala Vanilla Syrup and Vanilla Paste heighten the caramelized flavor of the golden pineapple top. Before you get to baking, stock up on Heilala Vanilla products! Heilala is offering our readers an exclusive 20% off discount on your vanilla purchase through their Amazon store! Just use code BAKEFS07 at checkout. Code valid until July 31, 2019. Preheat oven to 350°F (180°C). Butter the sides of a 9-inch cast iron enamel pan. In a small bowl, whisk together vanilla syrup, melted butter, and ½ tablespoon (9 grams) vanilla bean paste. Pour mixture into prepared dish. Sprinkle with brown sugar. Starting with outer edge of dish, arrange pineapple slices, curved sides against side of dish, over brown sugar mixture. Work your way toward center (with all pineapple slices facing the same way and slightly overlapping) until bottom of dish is completely covered. In the bowl of a stand mixer fitted with the paddle attachment, beat softened butter and granulated sugar at medium speed until fluffy, 3 to 4 minutes, stopping to scrape sides of bowl. Add eggs, one at a time, beating well after each addition. Beat in vanilla extract and remaining 1½ tablespoons (27 grams) vanilla bean paste. In a medium bowl, whisk together flour, baking powder, salt, and baking soda. With mixer on low speed, gradually add flour mixture to butter mixture alternately with buttermilk, beginning and ending with flour mixture, beating just until combined after each addition. Pour batter over pineapple, smoothing top with an offset spatula. Bake until a wooden pick inserted in center comes out clean, 45 to 50 minutes. Let cool in pan for 10 minutes. Run a knife around edges of dish to release sides of cake, if necessary. Carefully invert cake onto a flat serving plate. Serve warm or at room temperature. Love this recipe! Wondering if there could be a substitute for the cast iron enamel pan? Glass pie plate or non-coated cast iron, perhaps? Would this effect cooking time/temp? Hi Victoria! Yes, you can use a different pan for this recipe, but please keep in mind that we developed this cake specifically for the 9-inch cast iron enamel pan. We cannot guarantee the results if baked in another pan. This would effect the cooking time so be sure to keep an eye on it. Thank you and happy baking!